Clean Carfax and One Owner! Despite getting off to a rocky start, the 2017 Fiat 500 coupe and 500c cabrio have begun to worm their way into our automotive heart. The pair not only prove that Americans will buy small cars even when gas is cheap, but that an inexpensive small car doesn’t have to be boring, slow or poorly equipped. Smaller than both the Ford Fiesta and Mini Cooper Hardtop, what the 2017 Fiat 500 lacks in passenger space it makes up for with its playful attitude, long list of stand-alone options and varied lineup, including the all-electric 500e and sporty turbocharged Abarth. A low price and high level of detail seem at odds when it comes to most compact cars, but not the 500. If you’re in the market for a subcompact with mega personality, the 2017 Fiat 500 coupe and convertible have it in spades. With 15 possible color choices and a new options menu that allows for maximum personalization, the 500 outshines the Honda Fit, Smart ForTwo and even the Mini Cooper. For 2017, the 500 is simplified to just three trims: Pop, Lounge and Abarth. Most options are no longer bundled into packages and can be ordered a la carte on any trim. The convertible is also now available in any trim, while the Abarth gains standard rear-park assist. The subcompact 2017 Fiat 500 is a pretty lightweight affair, which explains why its 101- horsepower engine actually does a pretty good job of moving this little Italian tomato on wheels. Acceleration and passing power are not going to win over many enthusiasts, but in city driving, the 500 coupe and cabrio zip about quite nicely. Because it measures a mere 140 inches, the 500 has no problem finding parking. While we will always love a good 5-speed manual, we know most of the 500s out there will go into the world with Fiat’s 6-speed automatic. However, if you need more than just “okay” acceleration, the 160-horsepower turbocharged Abarth is the 500 for you. From handling to acceleration to braking, the Abarth is superior to the base 500. For those looking for a greener shade of 500, the electric 500e can travel up to 87 miles before needing to recharge. The 2017 Fiat 500 cabrio employs a rather unconventional power top. The canvas roll-top design opens the cabin to the elements while leaving a protective metal frame in place. Because it’s a roll top, the power top can be opened at speeds as high as 60 mph. It may not roll off the tongue as easily as “Cooper S” or “GTI,” but the lightweight 500 Abarth will put a smile on your face every time you put foot to accelerator. Nicely equipped for around $20,000, the Abarth offers a lot of performance for the money. Fiat’s subcompact 500 for 2017 is roomier up front than you might expect, and just as tight in back as it looks. The interior style lives up to the promise of the quirky but fashionable exterior, and we found the materials, build quality and seat comfort impressive for a car with a starting price around $17,000. As the athlete of the group, the Fiat 500 Abarth offers aggressively bolstered front seats, exclusive red stitching and a thick-rimmed, flat-bottom steering wheel. The subcompact 2017 Fiat 500 is a modern interpretation of 1957's tiny, rear-engined original. Although larger than the original, it's still seven inches shorter than today's Mini Cooper. The iconic sloping rear end embodies the 500’s personality, though it limits rear headroom. The Fiat 500 is available in a stretched 4-door model that alleviates many of the coupe’s shortcomings. The 500 is offered in Pop, Lounge and Abarth, all available in coupe or convertible form. The 500e electric is offered in coupe form only. Wheels, fascias and body trim differentiate the models. The 2017 Fiat 500 Pop includes a leather-wrapped steering wheel, 15-inch aluminum wheels, a 5-speed manual transmission, air conditioning, cruise control, power window/locks/mirrors, Bluetooth, and a 6-speaker 5-inch touch-screen audio system with a USB port for portable music players. The range-topping Abarth variant includes a 276-watt Alpine audio system, 16-inch hyper-black wheels, sport-tuned suspension and a leather-wrapped dashboard. Standard safety features include seven airbags, hill-start assist to help prevent vehicle rollback on steep inclines and seemingly all the other advancements we're seeing on new cars in this price range and beyond. A fully loaded 2017 Fiat 500 Lounge includes a 6-speed automatic transmission, leather seats, heated front seats, rear parking sensors, navigation, Beats by Dr. Dre audio system and automatic climate control. The 500 Pop Sport Appearance package adds sport fascia, 16-inch alloy wheels, rear spoiler, side ground effects and black-trimmed lights. The mighty Abarth offers larger 17-inch wheels, 2-tone leather-trimmed seats and your choice of either white or red body-side stripes. The front-wheel-drive 2017 Fiat 500 subcompact is motivated by a small but sophisticated 1.4-liter 4-cylinder engine using Fiat’s patented MultiAir technology, which varies intake-valve timing and lift. Fiat tunes this engine to two power levels: The 500 Pop and Lounge get a 101-horsepower (naturally aspirated) version, while the turbocharged Abarth cranks out 160 horsepower. The 500e electric is rated for 111 horsepower and 147 lb-ft of torque. With the exception of the 500e, all of the 500s offer the choice of a 5-speed manual or 6-speed automatic transmission. We like the automatic for its extra ratio and responsive shifting though it does cut fuel efficiency by more than 10 percent. The 500e uses a single-speed automatic. The 2017 Fiat 500 lineup receives new, lower pricing this year, with the Pop starting at a Manufacturer’s Suggested Retail Price (MSRP) right around $17,000. The Lounge climbs to just over $20,300, while the convertible version adds about $1,500 to any trim. The Abarth starts right around $21,000, a drop of nearly $2,500 over last year’s car. The California-and-Oregon-only 500e electric tops out around $32,800. However, incentives and tax credits can trim that price substantially. The 2017 Mini Cooper Hardtop starts right around $22,000 and can top $35,000. 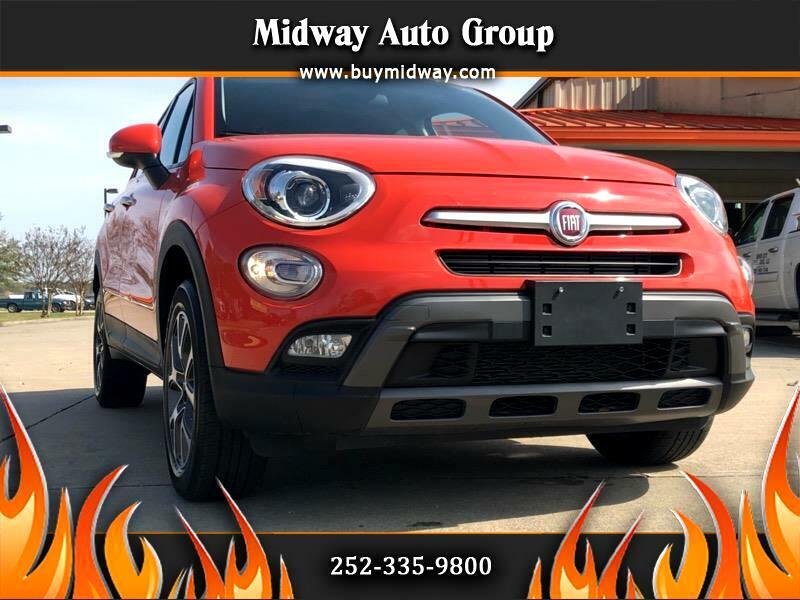 Fiat includes a Mini-matching 4-year/50,000-mile bumper-to-bumper warranty with roadside assistance and a 3-year/36,000-mile no-cost maintenance package. Kelley Blue Book Fair Purchase Price should reflect real-world transaction prices close to MSRP, so be sure to check them out before you purchase. Five-year projected residual values for the 500 fall considerably short of the Mini’s, but remain slightly higher than the Ford Fiesta’s. Message: Thought you might be interested in this 2017 Fiat 500x.